Filling, scrumptious and simply delicious, our apple and cinnamon crumble can be made as one large dish or cooked in seperate ramekins – whatever your preference, this is a firm traditional British staple pudding. Andrew: I like the cinnamon twist to this. Peel and cut into chunks the apples. Put in a saucepan. Add the 10g of sugar and water. Cook on the hob until the apples are partially softened, stirring so that the apples don’t stick to the saucepan base. Once softened, spoon the mushy-looking apples into a large cooking dish or four ramekins. Set aside to make the crumble topping. Dawn: You can add additional soft fruits at this point, too. Dawn: Yes, Andrew or dribble 20-30g of sultanas or currants into the apples so they are generously strewn amongst the apples. I do like blackberries added at this point especially if they’re hedgerow ‘freebies’. Andrew: It’s worth pointing out that if you use cooking apples, you may decide to add a little more sugar as they tend to be less sweet than eating apples. To make the crumble topping, put the flour, spread, sugar and salt into a large bowl and using your fingertips, rub these ingredients together until they have combined to form what resembles fine breadcrumbs. Add the flaked almonds and gently combine. Andrew: Be gentle at this point as you don’t want the almonds to become too fine. Dawn: That’s right. I personally like the almonds to retain much of their size and shape as it adds to the finished texture and almost crunch-like quality of the topping when cooked. 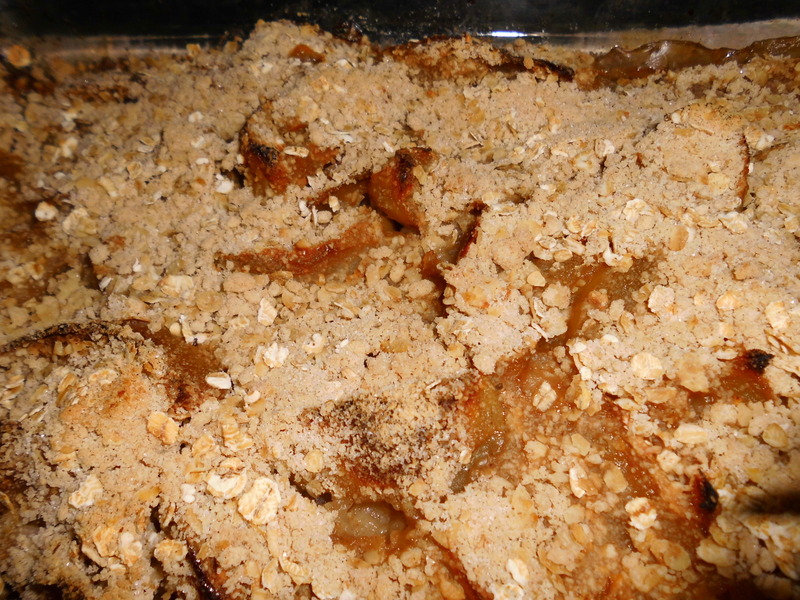 Next, add the oats and with equal care shown to the almonds, combine these with the existing crumble mixture. Add and combine the cinnamon. Andrew: If you haven’t any cinnamon, use mixed spice. nutmeg or ginger. Whatever ground spices you may have in will all work really well here. You are now ready to sprinkle the crumble topping over the apple base. So, spooning the mixture, spread the topping equally over the apple fruit base. Place a pre-heated oven at gas mark 4/electric 180 degrees for about 35-40 minutes until the apple juices are bubbling and the crumble base has turned a nice golden light brown colour. Andrew: Serve warm with either ice cream or fresh cream. Put the frozen mixed berries, 15g of the sugar and the 4 tbsp of water in a small saucepan and gently heat. The mixed berries will slowly thaw and start to release their fruity juices with the water and sugar combining to make a consistency similar to runny jam. While this is happening, stir constantly and start to make the actual pancake batter mixture. Put the flour, remaining sugar, egg, milk into a bowl and mix until the ingredients have combined to make a relatively thick batter. Andrew: Can I add fresh fruit to the batter mix, Dawn? Dawn: Yes, and sometimes I do. 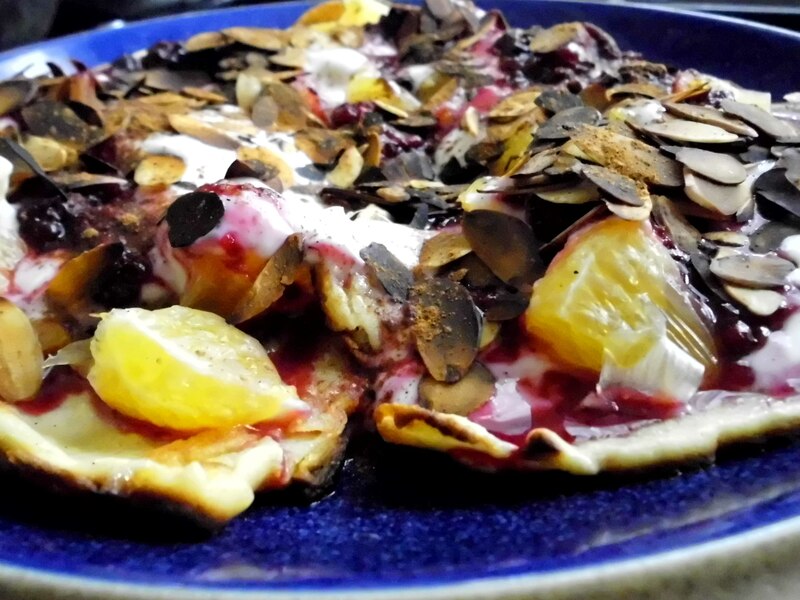 This recipe tastes great with or without extra fruit so it’s all down to the individual. You can also use fresh fruit to make the fruit sauce topping if you prefer. I like the frozen mixed berries because they’re easy to store in the freezer and the majority of supermarkets stock their own brand that are usually inexpensive. A freezer staple, for me! Put the oil in the frying pan and allow to heat. You’ll start to see the oil bubble and a little heat haze coming off it. When it’s at this point, it’s ready to use. If the oil isn’t hot enough, the pancakes aren’t quite as nice, so wait until the oil is bubbling and hazy before you start to pour the batter mixture in. I spilt the batter into two roughly equal portions or it will easily make three smaller sized pancakes. Keep them apart in the frying pan as they cook. They should start to spring up and gain a depth as they cook. Andrew: And the pancakes will start to bubble when it’s time to turn them? Dawn: Yes, that’s right, Andrew: you’ll be able to see when the one side is cooked as the visible side starts to have little ‘air bubbles, holes’ appear. So flip the pancakes, making sure you keep them separate and not touching each other. Check to see if they are golden brown by lifting them a little with your spatula and when both sides have turned a glorious golden brown colour, serve them on a warmed plate. Top the pancakes with sliced banana – I’ve used a juicy orange here or any fruit like fresh pineapple, cut into chunks will be just as delicious. Then spoon some natural yoghurt and the warmed runny mixed berries juices over the pancakes and your preferred sliced fresh fruit. Sprinkle a little cinnamon on top and hey presto! A breakfast to set you up for the day! Andrew: Quick and easy to make! Mmm…this tastes wonderful!